I've been thinking so much about the 50th that Carlisle has slipped my mind. Just now I posted the details for this year. It's pretty much the same as previous years. This is the eighth year we have done this. Hard to believe. When you register, specify "triplewhitefox.com" under club. Even if you bring a non-feature car please do this especially if you have no other club affiliation for that car. There is no need to park with the feature cars to be part of the "club". They do track # of cars per club and it helps. And, I think it's cool to walk around the show field and see cars in other classes with "triplewhitefox.com". My understanding is that this year the tent will be provided at no charge. At least that was what was communicated to me when I complained last year when our tent was located away from the class where our cars are parked. Count me in this year, Fri-Sun with 1993 white. Very good. I can't wait to see that car in person. I will be there all weekend too with the 93. Great news about the tent!! Amy, that's great to hear. I can't wait already. It's nice to have something to look forward to. As we talked about before, looks like I will more than likely not be there this year. If something changes, I'll be sure to let you know! If you haven't already seen it, the Carlisle Invitational vehicle list has been published. 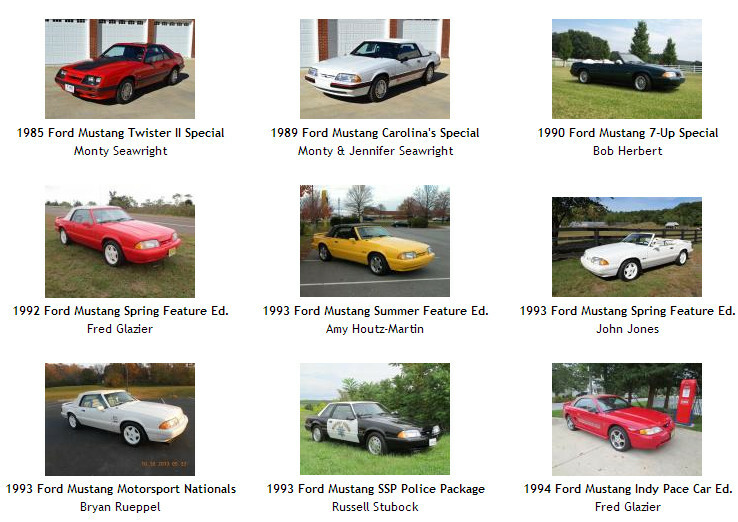 As previously known, Building T will host a display of Mustang special editions. From the published list, it looks like there will be a lot of great fox-bodies including 5 that are our favorite - feature cars, mine included. Here's the section of the guide that contains those cars. The full invitational list is here. Cool cars for sure. Making me excited for a great weekend. I have my rain gear packed. Check out the 1985 Mustang GT Ford Motorsport Nationals car. Hoping for another great year at Carlisle. John I am staying at the Days Inn and can help you get around during the weekend if need be. The 1993 TWF is all registered. Let me know if you need assistance getting around. Don't rent a car. Awesome pics! Glad to see your car John back inside where it belongs!!! Going to Zaino it?? Looking at the invitational cars, I'm 99% sure that 95 Cobra 2 Top (hence my screen name) is my old car. That car was also under the roof when I owned it. Can't wait to see it again along with yours. Tom, I'm staying at the Days Inn as well. I did reserve a rental car as I'm not sure if I will be alone or with the kids. I did so because I was kind of freaking out about what I am going to do. I remember my first Carlisle where the guy with the 1992 red feature car in building T drove it from Canada and he and his wife were walking to and from the hotel every day. I looked into a lot of options including renting a truck and trailer but that seems not to be possible. Anyone who rents a truck excludes towing in their agreement. I even (very) briefly considered if I should buy a truck capable of towing. Ken, that car keeps on popping up, doesn't it? It's a great car. I have continued to use Zaino since you recommended it. Every year I've put a coat on and even use it on the daily drivers. Although, this time around I'm going to try some of the Optimum Car Care products on it. Got to try different things once in a while. Tom and John, Which days inn are you staying at? We are staying at Days Inn North. We can possibly help out with rides as well. We are thinking of trailering the Roush up so we have the truck to drive around in. The 79 is going to be in the 50 yr display. Ken - I spoke to the owners of that cobra last year as it was in the svt display last year inside. The car is really nice especially the interior. Totally looking forward to Carlisle! !